In just over 15 years (if all goes well) it will be WrestleMania 50. So, for a bit of fun let's hear some predictions. Some variation of inter gender six man tag involving Steph McMahons daughters and Shane OMacs sons. For control or the company. With a McMahon in every corner. I was going to say they'll be banging on about it being, " the fiftieth anniversary!" but then I realised they haven't done that once for Wrestlemania 35 yet. Maybe they've finally figured out what, "anniversary," means. Dolph Ziggler will be challenging for, or defending, one of the midcard titles. Instead of pointing to the sign, wrestlers will have to bow in deference to the portrait of Supreme Leader Trump that hangs in every arena and stadium. As PPVs continue to swell in length, the show will begin with the last match of WrestleMania 49, which has been going continuously for just over a year. WrestleMania 50 will finish about halfway through WrestleMania 53. At the very least it wouldn't surprise me if it's over two nights by then. Or 5 nights in 5 cities (in Saudi). Nicholas will return to get back what is rightfully his. WM50, 50 matches over 50 countries. Over 500 talent used. Pre-show will last a week, starting in Kathmandu with a Himalaya Heights Mountain Pass Street Fight between Nicholas and Braun, to finally prove Braun was the Janetty of the team. Next, to Pyongyang, for a 200 person battle royal, with the winner getting a bottle of Courvoisier personally signed by Kim Jong-Un. First elimination will be summarily executed. Continuing through Asia, NXT China title will be contested in Tianamen Square, falls count anywhere. NXT India title in Delhi, but audio only due to smog. 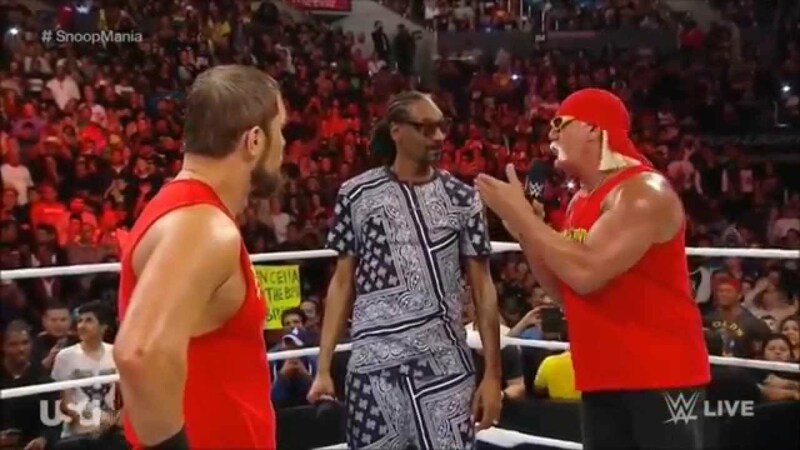 The Hall of Fame class contains such luminaries as Dolph Ziggler, The New Day, and in the celebrity wing, Snooki and Snoop Dogg. Main event six pack challenge, a McMahon in every corner. Fireworks and ticker tape as Shane involves himself, breaks a hip on a coast to coast, and soils himself, leading to a submission victory. There won't be a Wrestlemania 50, the world has been nuked to bits by then and closest thing to a 'Mania will be a guy called Kenshiro exploding people with his sick moves in a makeshift coliseum. Instead of pointing to a sign he points up to the top of one of the few remaining high rises, at the boss he's about to kill (which happens to be an old Triple H). Believe it or not, Snoop was already inducted 3 years ago!